With Simon Pegg, Nick Frost, Martin Freeman, Eddie Marsan, Paddy Considine, Rosamund Pike. Written by Simon Pegg & Edgar Wright. Directed by Edgar Wright. Rated R for pervasive language including sexual references. 109 minutes. 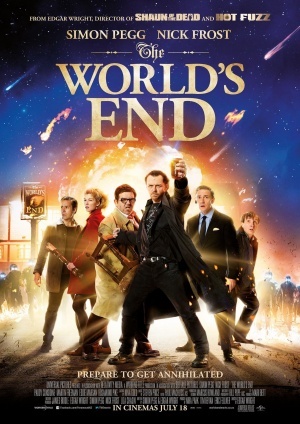 Now as summer is winding down and its movie season comes to an end, we reach THE WORLD’S END, which may be one of the most entertaining movies to have come out this summer. Certainly, fans of “Shaun of the Dead” and “Hot Fuzz” have been anticipating it. These are very British comedies that have gone through the filter of mostly American film genres, and the result has been a hilarious series of hybrids about growing up and facing reality… well, a kind of reality. Simon Pegg (who co-wrote the script with director Edgar Wright) stars as Gary, who’s pushing 40 and sees his life as one of failure and blown opportunities. Once one of the coolest kids in school, he’s one of those pathetic adults who obsesses over his youth. His latest project is to reunite his four best friends––whom he hasn’t seen for years––for an epic pub crawl, during which they will visit and hoist a pint at all twelve pubs in their old home town. Of course, his friends have moved on with their lives. Some have married, all have jobs, and the idea of getting drunk in their old home town doesn’t have the appeal it had when they were 18. In fact Andy (Nick Frost) doesn’t even drink any more. Yet Andy, Oliver (Martin Freeman), Steven (Paddy Considine) and Peter (Eddie Marsan) let themselves get talked into it. If you’ve seen the other two films in the “Cornetto Trilogy” that Pegg, Frost, and Wright have done together, you know that something odd is going on in whatever British town the characters find themselves in, and that’s the case here. However, the film takes a while to reveal just what’s happened, and at first the group think they’ve simply gotten out of touch. Yet the pubs are numbingly the same, the people are friendly but distant, and there’s something not quite right going on. As they persevere and get drunker (Andy falls off the wagon at some point), they not only make discoveries about the town, but about themselves. It turns out that they all have unresolved issues from their youth, not just Gary, and this pub crawl turns into a comic long dark night of the soul. Part of the comedy comes from learning the town’s secret, but a lot of it is also character-driven. Where teenagers long for the freedom and power of adulthood, these adults are only too aware of the tradeoffs they’ve had to make along the way, and look back to their youth as a special time. The further they explore, though, the more they realize that their memories of the past may not match up with the realities. Pegg and Frost are wonderful together, having worked on several films and the British sitcom “Spaced.” Here they both play against type, with Pegg’s Gary out-of-control and irresponsible and Frost’s Andy the one who is buttoned-down. Martin Freeman, Eddie Marsan, and Paddy Considine keep up as the other friends, who have their own issues to deal with, including Sam (Rosamund Pike), over whom Gary and Steven are still fighting, much to the consternation of Oliver, her brother.